It has been a while since I last posted an aquarium update; I have been a bit busy and have not done much with the tank recently. I have not done any water changes, never use the skimmer but have had zero algae because I have kept the light level low. I have experimented a bit with various seaweeds but nothing thrived. The Chrysemenia was doing well growing on the Tunze pump but disappeared overnight. Kelp always does well when attached to the pump. The tank is still a bit bare so no ‘full tank shot’ but some inhabitants below. 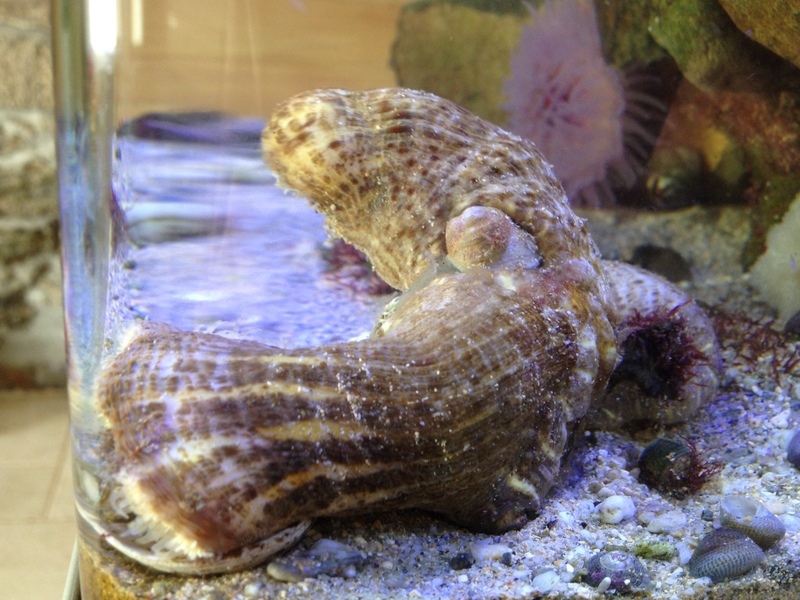 I collected some Parasitic anemones Calliactis parasitica attached to an empty shell figuring that a not so pretty species might be actually quite hardy. Turns out they just stayed a bit limp and I therefore returned them to the sea. The Tompot blenny is a real character, very alert and always hungry. If you stick your finger in the water he immediately comes and nips it. The small scallop remarkably survived over the summer (remarkably because there is almost nothing to filter from the water) but the hungry Tompot ate it in the end (like most other snails). 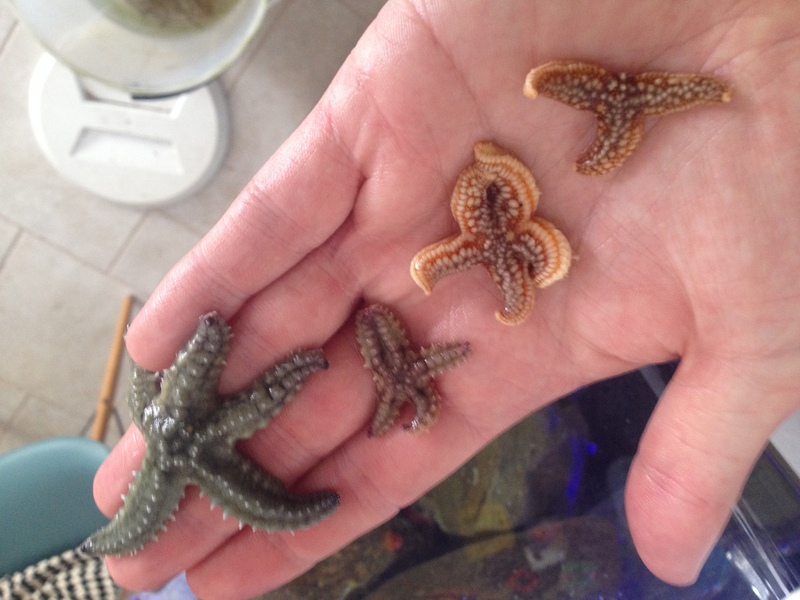 As the snails were not going to last long anyway, I introduced two small Common starfish Asterias rubens and two small Spiny starfish Marthasterias glacialis. They are usually hidden but that makes it extra fun when you spot one. The Cushion star Asterina gibbosa of course remain unperturbed and are always on the prowl. 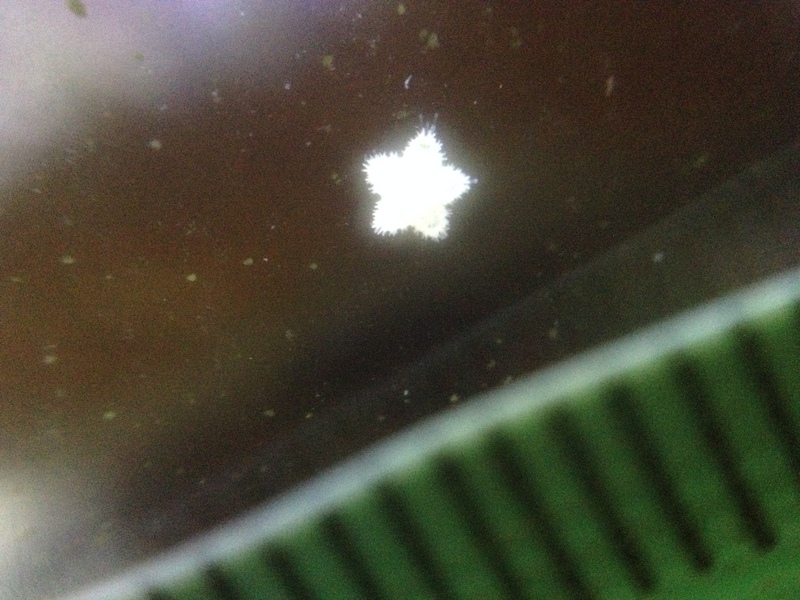 I noticed a tiny offspring (<2 mm). This entry was tagged Asterias rubens, Asterina gibbosa, Calliactis parasitica, Common starfish, Cushion star, Parasitic anemone, Tompot blenny. Bookmark the permalink.